Now this looks like a fun event! 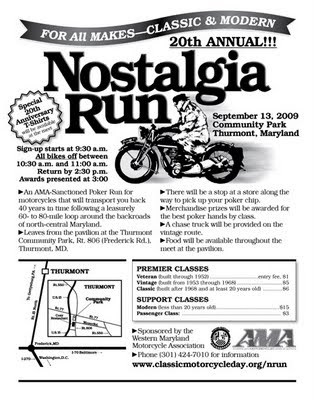 The 20th annual Nostalgia Run, an AMA-sanctioned poker run for vintage and classic motorcycles, will be held at Community Park in Thurmont, Maryland on September 13, 2009, sponsored by the Western Maryland Motorcycle Association. I'd like to try to make it this year, as a spectator of course, not a participant. For years, I've been meaning to do some riding in that part of Maryland -- it's supposed to be terrific. Here's the website for the event.